As I’ve mentioned in a previous post, I’m no fan of player-versus-player (PvP) combat in MMOs. According to the Bartle Test, I fall squarely into the “Explorer” category. I’m more interested in surveying the virtual world around me than in being pwned by a 12 year old. Although some MMOs are PvP-centric, most keep it cordoned off from the PVE sections of the game, and provide players with the choice to opt in or out at their discretion. Often, if PvP combat is the central theme of an MMO, the game designers still provide a protected “beginner” area where players can learn the game’s mechanics before being thrown to the level 50 Wolves of Ganking. Player versus player combat has always been a part of Pirates of the Burning Sea, and for this game’s genre, it makes sense. Epic sea battles are its mainstay. But what doesn’t make sense, is the developer’s decision to allow high level players to attack low level players in the beginner areas. PotBS has a map conquest system that I profess to not completely understand. It involves seizing your enemy’s ports by attacking their ships as they sail in or out. Players often exploit this by camping outside the ports of the beginner areas, because they know that low level players will be attempting to move between the ports to complete PVE missions. It makes sense strategically, but it creates a miserable experience for new players. I recently got stuck in a British port at level 10, unable to complete any more quests because high level pirates would attack anyone who tried to leave. I asked in chat if there was any solutions to this problem. 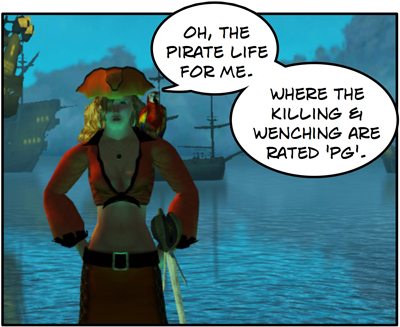 Someone suggested – without a hint of irony – that I should log out of the game until the pirate players had left the area. PotBS’s player population has been declining since the game launched 2 years ago. Slow, repetitive combat and a steep learning curve were some of its biggest drawbacks. Currently, Flying Lab Studios is in the process of closing 3 of their servers, leaving only two – a US and a European server – remaining. In light of this waning player base, it strikes me as odd that FLS would allow a game mechanic that is so detrimental to the retention of new players. One veteran player cynically referred to it as “baby seal clubbing”. I call it “going bankrupt”. Pirates of the Burning Sea is a game for which I have some very conflicting emotions. I’ve always been a fan of the pirate genre. I even had pictures of Errol Flynn hanging in my bedroom when I was a kid, and I read every book about historical pirates that I could get my hands on. Unfortunately, Pirates of the Burning Sea (PotBS) doesn’t exactly live up to my expectations of what an online pirate game should entail. Don’t get me wrong – the game’s environments are gorgeous, the writing is superb, and there is a lot of fun to be had. But the actual game play is painfully repetitive. The majority of the game is spent in ship-to-ship combat, which may be a lot of fun when you’re doing open sea PvP port battles with other players, but when completing the game’s PvE missions it gets dull quick. One unique feature in PotBS is “User Content”. Players can create flag, sail, and even ship designs, that if approved, can be used in the game. When the game first launched, the approval process for the sail and flag designs was rather haphazard. Players would upload their designs to the PotBS website where other players could vote on it. If your design received enough votes, you were allowed to use it in the game. This resulted in a lot of goofy designs that were more than a little anachronistic. Eventually, a “Steering Committee” was created to review all of the player content before it was allowed to be used. At the same time, a lot of previously accepted player content was rejected. This leads to my rather sad mermaid tale. 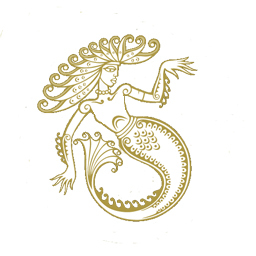 When the game launched, I created what I thought was a tasteful, attractive and period-appropriate sail design of a mermaid (See ‘Before’ image.) My design was quickly approved and I was happily sailing the high seas in my pink Bermuda Sloop and mermaid-patterned sails. After a few months I quit playing the game and did not return for almost a year. Upon my return I discovered that my character had been moved to another server and my mermaid sail design was nowhere to be found. Thinking that it was a simple error caused by the server move, I resubmitted my sail design. Which was promptly REJECTED! Flabbergasted, I sent a message to the Steering Committee, asking for an explanation. I was politely told that my design had been rejected because the ‘breasts’ on my mermaid were too ‘vague’. I would need to put a pattern on the design to indicate that my mermaid was wearing a bra, or remove the ‘vaguely breast-like circles’ completely. WTF? My poor mermaid was deemed ‘offensive’ because her breasts were too ‘vague’? In a fit of indignation I removed the ‘breast circles’ from the design completely and resubmitted it. My ‘breast-less’ mermaid was approved (See ‘After’ image. ), but I lost a lot of respect for the folks at Flying Lab Software as a result of this incident. I realize that the developers must comply with the ESRB’s standards, which are probably a bit arbitrary at times. But PotBS is not marketing itself as a children’s game. And the game is about PIRATES for cryin’ out loud! How can shooting, stabbing, burning and pillaging be OK, but round ‘breast-like’ circles on a mermaid flag design be considered ‘offensive’? How can we have such a pronounced contradiction in our culture, where violence is more acceptable than anything remotely resembling the naked human body? I bet Edward Teach would have been amused.